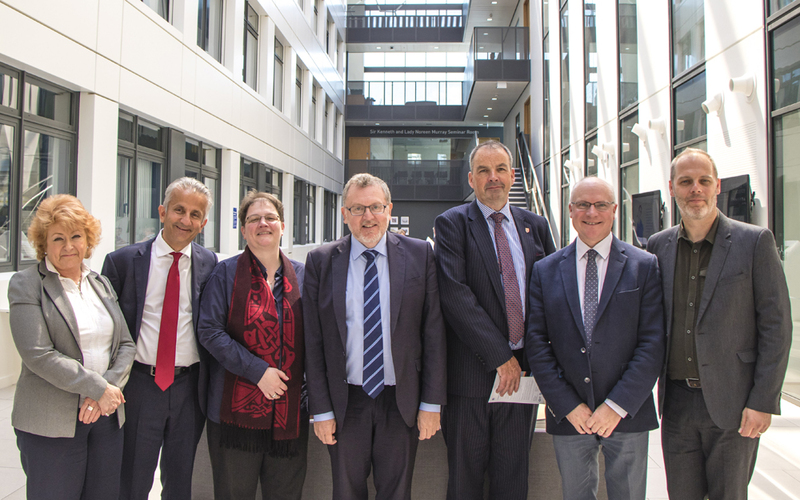 The Secretary of State for Scotland, Rt Hon David Mundell MP, heard details of the bids being made as part of the Tay Cities Deal to bolster Dundee’s considerable strengths in biomedical sciences, forensic science and cybersecurity, in a visit to the city today. Representatives of the three bids, including one involving the School, met with the Secretary of State at the Discovery Centre in the School. The bids are set to transform the innovation capacity of the Tay Cities Region delivering jobs and long-term growth. Dundee is world-renowned for Life Sciences research and drug discovery and has unique opportunities for Medical Technologies and skills development at the interface with the NHS and industry. Both are already attracting inward investment and creating new jobs. The project will massively accelerate this by providing an Innovation Hub with specialist business support to house and grow new BioTech and MedTech companies. New skills training for quality jobs for the local workforce is a major focus of the project. This exciting collaboration between the University of Dundee, NHS Tayside, Dundee & Angus College, industry (global and SME level) and private sector investors will deliver jobs through innovation and improved health outcomes for the people of Tayside and beyond. The project leverages Dundee’s burgeoning reputation in forensic science research to create a new economic cluster for the Tay Cities Region. Operating in a fast growing global sector and with ever wider translational opportunities it will harness the economic benefits of new knowledge, working with start-ups, SMEs and corporations. While creating new jobs and economic growth locally and nationally, the project will define, develop and deliver the science and technology needed to serve justice in countries across the world. The project will catalyse the formation of a geographic cluster of cybersecurity companies in the Tay Cities Region by harnessing the supply of highly skilled labour, nurturing emerging and respected cybersecurity talent and realising the commercialisation potential emerging from innovation, education and research at Abertay University to realise new economic opportunities for cyber security through innovation, cutting edge research in ethical hacking and adoption of products, services and practices in all sizes of business from small charities to large businesses. The cyberQuarter creates a cluster of academic-commercial innovation located within the Tay Cities region to exploit the existing expertise of Abertay University in ethical hacking, the digital industries ecosystem of Dundee city and the exceptional model of business support offered by SBRC.